Driving up to The Laurel Tree in a town called Utopia, TX, I knew I was in for something special. As I made my way further from the bustle of San Antonio and deep into the Texas Hill Country River Region, it became clear that this town was aptly named. Getting out of the car, I had one of those Crap, this place is Instagram gold moments, and I consider myself a good judge of such situations, regardless of how douchey that sentence just read. 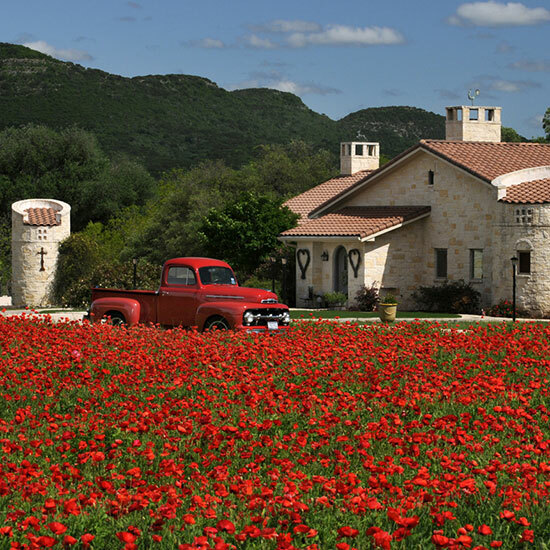 Picture this: Outside, on the restaurant's impeccable grounds, the first thing I see is a vibrant red poppy field which has conveniently parked itself next to an even brighter red 1950s pickup truck. Around the corner, I spot *the* reason I came to see this place, an impressive 450-year-old oak tree which Laurel Waters, chef and owner, has turned into quite the exclusive private dining room with the help of Animal Planet’s Treehouse Masters. This incredible cocoon, which you reach by ascending a ramp and can seat up to six people, is perfect for intimate birthdays, anniversaries, family dinners, and engagements — and it all happened by a happy accident. Laurel had been running her successful restaurant, slowly making addition after addition as its popularity grew, when Pete Nelson and the Treehouse Masters crew came through and suggested she create a dining room in one of her oak trees. She fell in love with the idea, and the result is a setting that’s unlike anything I’ve ever eaten in — it’s certainly not the treehouse your dad built for you and your siblings when you were a kid, but more of an elegant private dining space complete with antique furnishings, unique artwork and a porch to sit on and relax after a satisfying meal. And a satisfying meal it will be. Chef Laurel changes the menu every single Saturday and never has food delivered, so she hand-selects all menu items herself and uses ingredients from her Potager (kitchen garden). When I visited The Laurel Tree, I had a roasted butternut squash soup with sage, bacon and garlic croutons, chicken and avocado with comfort-style mashed potatoes, and a buttermilk pecan tartlett that was out of this world. If you're looking to dine in the treehouse itself, call in advance. Slots book up quickly (blocks of reservations usually open at a specific time and date, so call to see when the next block is opening up), making it quite the exclusive dining experience. You can also eat inside The Laurel Tree’s main dining room, a cottage cafe bistro — which is very much a destination in its own right — and reservations are much easier to come by, but still very much mandatory. The Laurel Tree is about an 1.5 hour drive from San Antonio, so I’d suggest making a day trip or overnight out of your trek there. There’s lots to do in the Texas Hill Country River Region — an unspoiled part of Texas where beautiful trees line rugged rolling hills — like tubing down the Frio River, visiting the charming downtown of historic Uvalde, or horseback riding high into the hills at Elm Creek Stables.